Wildcat strikes in informal sectors are challenging unions' assumptions about where and who to organize. On August 11, surrounded by 150 wildcatting Deliveroo drivers, a union activist read out a list of concessions won by British couriers, all of whom organized with the Independent Workers of Great Britain (IWGB) union. Courier workers won a 28 percent raise; CitySprint workers won 17 percent — their first in ten years. At Mach1, riders won higher pay, company-provided uniforms, and an end to equipment rental fees. Just a week earlier, cleaners ended the longest strike in the City of London’s history — sixty-one days — after securing the London living wage (currently £9.40 an hour). They organized under United Voices of the World (UVW). In February of this year, UVW won occupational sick pay for casualized security guards and cleaners in a highly public campaign at Sotheby’s. Inspired by the Deliveroo strike’s victorious conclusion, drivers from Uber Eats announced they would hold a wildcat strike until the company agrees to pay them the London living wage. You’d be forgiven for thinking that the labor movement in the United Kingdom is finally waking up. Since the formation of the Cleaners Branch of the Industrial Workers of the World (IWW) in 2011, stories like these have become more frequent and more successful. Militant, worker-led campaigns have been waged against retail chains, cultural centers, educational institutions, and delivery services, organizing thousands of precarious employees. Yet in 2015, only eighty-one thousand workers participated in strikes, and only 170,000 days were lost to labor action. These figures represent the fewest strikers and the second-smallest loss to productivity since records began in 1893. Last year also marked the lowest level of trade union density since 1995, just 24.7 percent. The cleaner and courier disputes therefore represent a rare pocket of labor militancy, not a wider revival of the movement. This alone would make them interesting. But because these actions come out of a labor sector — casualized labor — that has traditionally been considered unorganizable and neglected by the mainstream trade unions, the Left should pay attention to what they can teach us. These campaigns contradict long-held beliefs about organizing casualized labor. Their frequency and reach — which continue to rise — and the high strike ballot turnouts indicate strong worker participation. And yet mainstream unions rely on a self-defeating set of organizing criteria that makes these workers invisible. Trade Union Congress (TUC) unions often shy away from casual workers for a variety of reasons: some lack the skills, experience, and resources to organize this sector. Others have performed cost-benefit analyses that indicate such campaigns aren’t worth their time. Some even believe that casual workers don’t count as real workers and therefore fall beyond their scope. At the root of mainstream unions’ inertia lies a strictly legalistic understanding of workers, employment rights, and employee-employer relations, with the collective bargaining unit as the central point of reference. Casualized workers largely fall outside of this framework, and they are subsequently dismissed as unorganizable. As a result, the informal sector has become overwhelmingly un-unionized and suffers under the worst conditions in the labor market. How TUC groups developed this legalistic dependence is a longer story. What matters here is that businesses adhere to these same criteria, and battles between bosses and workers take place on this ground. In recent years, capital has taken the offensive against these workers. In the formal sector, companies have worked to change employment tribunal costs and further restrict legal strike activity. They’ve also sidestepped the framework altogether by creating more casual positions. These jobs — which use external agencies to hire workers, classify some workers as independent contractors, or rely on zero-hour contracts — strip away many of the protections enjoyed by traditional employees, while maintaining the practical working conditions of any employer-employee relationship. Deliveroo’s employment practices perfectly demonstrate this. By calling its couriers “independent subcontractors,” the company does not legally have to provide sick pay, holiday pay, pension contributions, or the minimum wage (£7.20 per hour). But these so-called contractors work under the same obligations as regular employees. Most gallingly, they cannot work for any other courier service even though Deliveroo refuses to pay them a living wage. This precarious work model circumnavigates the legal framework regulating employee-employer relations. Workers find themselves under further restrictions, while having risk and costs offloaded onto them. This has allowed companies to extract greater profits with less investment. Not coincidentally, Deliveroo’s attempt to replace its hourly wage with a per-delivery pay scheme came just weeks after the company received £212 million in investments and readied to face its new competitor, Uber Eats. The company had to intensify its profit model in response to both shareholder and market pressures. 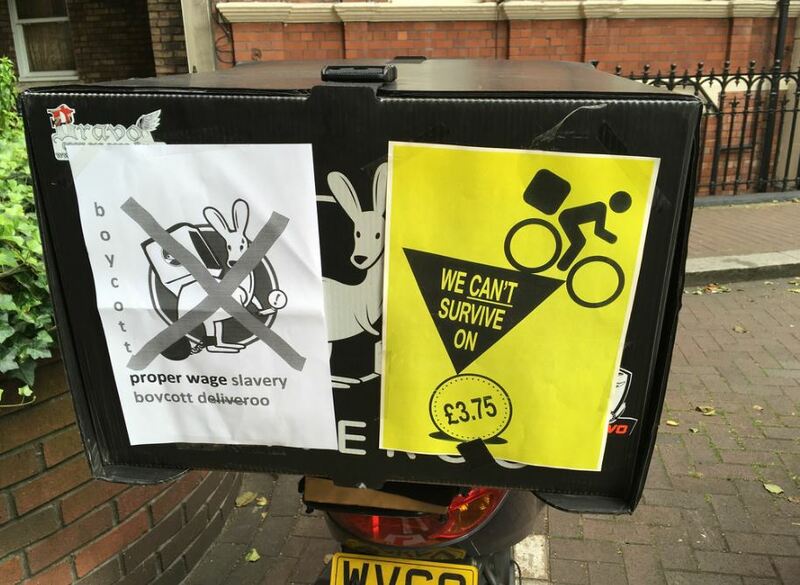 Deliveroo’s externalization of risk and cost onto its workers reflects not only the changing protocols of profit-making, but also capital’s ability to exploit weaknesses in labor’s legal framework. While legal creativity allows businesses to shed expensive employer obligations, it has a potentially very costly side effect: class antagonisms take place outside the state arbitration system long used to secure labor peace. With legal avenues either formally closed or financially unviable, casualized workers must explore alternative methods to improve their working conditions. All that is needed is a tipping point, and — especially in the United Kingdom under austerity — these are easy to come by. As companies find new ways to extract profit, new frontiers of class conflict open up. Capital overcomes previous limitations, offloading cost and risk more or less legally. The appropriate response to this erosion of rights is outlawed by the existing employment laws and state arbitration frameworks that limit TUC activity. But outside those boundaries, much is possible. The Deliveroo and Uber Eats wildcat strikes rapidly halted the supply of labor — a devastating move for essentially on-demand businesses. In contrast, a legal strike takes weeks to mobilize, giving the companies abundant time to make contingency plans. Deliveroo drivers took just hours to organize their first stoppage. Similarly, drivers from the company quickly gathered in picket lines around Deliveroo’s recruitment office when they learned that the company was trying to hire strikebreakers. In a TUC context, this would have to go through layers of legally sensitive trade union bureaucracy before approval. The current strike wave highlights how modern capital’s speed and flexibility demands an equally responsive and versatile labor movement. When capital rolls back labor protections, it clears space for just such action. As refreshing as these recent campaigns have been, they only involve a few thousand workers in an informal sector of millions and in a total British workforce of ten times that. Kim Moody recently warned against the dangers of fetishizing the gig economy and challenged the widely held belief that greater numbers of workers are moving into precarious jobs. He argues that focusing on a separate precariat obscures the fundamental problems shared across the working class: namely the “crappy jobs” that result from work intensification. Following her and Moody’s analyses, precarity becomes a useful idea that reveals the common patterns uniting the informal and formal sectors of the workforce. Companies increasingly audit and monitor their employees’ output in this arena. Workers are judged against a norm that grows more demanding due to worker competition. Future employability within the same firm becomes dependent on a worker’s most recent performance reports. Subsequently, “[l]ife inside the corporation [comes] to resemble life outside it ever more closely,” as costs and risk are offloaded onto workers within the formal sector. This also holds for blue-collar workplaces. For instance, workers on short-hour contracts (under ten hours a week) may not be counted as casualized workers because legally they have rights to paid time off and other benefits. Nevertheless, they experience the same problems. Many short-hour workers would prefer a full-time contract. The lack of guaranteed, higher hours ends up looking a lot like a zero-hour contract, as workers increase productivity or put in longer hours for free, in order to “earn” the extra shifts. Thinking of precarity this way, it becomes clear that the formal sector is adopting profit-extraction schemes from the informal sector. As it does, new frontiers of class conflict will open up that call into question the utility of TUC union methods. But the labor movement will only win this new terrain if they fight it with new methods. For labor to respond effectively to the rise of precarity, it will have to follow capital beyond the legal boundaries of class relations. Casualized workers’ current campaigns serve as a testing ground for class antagonism beyond state arbitration. Where the fewest legal protections exist, we find the greatest potential for innovative class conflict. Given the recent successes of extra-legal action — and the continued stagnation of traditional unions — workers may increasingly find the unfamiliar territory more appealing and more productive than the familiar. The new logistics hubs massively rely on casualized workers supplied by temp agencies. It will not be enough for unions to target these shops with old-fashioned methods. Instead, they should apply the lessons learned from current casualized struggles to this new organizing initiative. Some efforts are underway to critically address these challenges, but they will need to be replicated on a far greater scale before we see any results. The spread of wildcat strikes among British workers indicates that this is possible. The courier and cleaner campaigns are publicly redefining the concept of labor organizing in the United Kingdom. The outcomes of messy, heated street conflicts repeatedly show themselves to be preferable to invisible, streamlined court settlements. The great irony is that, thanks to independent organization, these so-called precarious workers are enjoying improved workplace security while many unionized workers watch their conditions erode and their security disappear. The labor movement would do well to decipher this paradox and put its lessons into practice. Wildcat strikes in informal sectors are challenging unions’ assumptions about where and who to organize.